The Mount Washington Observatory says it was only an inch, but snow fell Monday for the first time this season. For the second time in four days, the mountains of New England received a coating of snow with that windy cold front Wednesday night. But this time, a few New Englanders woke up to a little snow in their yard, making this the first snow of the season for some below the mountain tops. Ross Budd in Francestown New Hampshire, down the hill from Crotched Mountain, shared of photo of snow on his deck, confirming a few flakes last night. 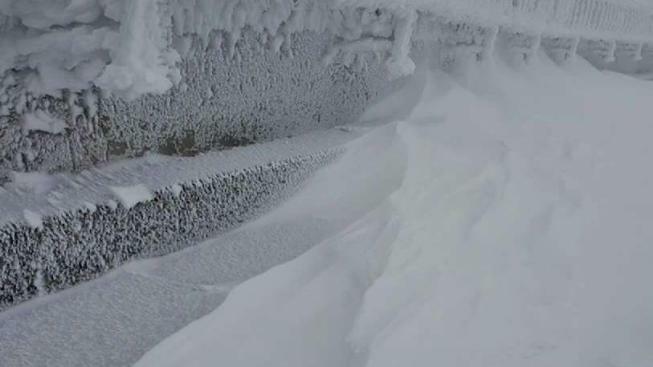 Well to the north, at 6,200 foot elevation, the summit of Mount Washington got 4-inches of new snow. And west to Killington, Vermont, the ski resort fired up snow guns and announced opening day for skiing is Oct. 19. They call it the longest ski season in the east, known as the "Beast." As in - Beast Of The East. Our cold sticks around for about 24 hours, just long enough to get a trail open at the top of the mountain. We may see some more mountain snow again Saturday night. We are in a new colder and drier weather pattern in New England.